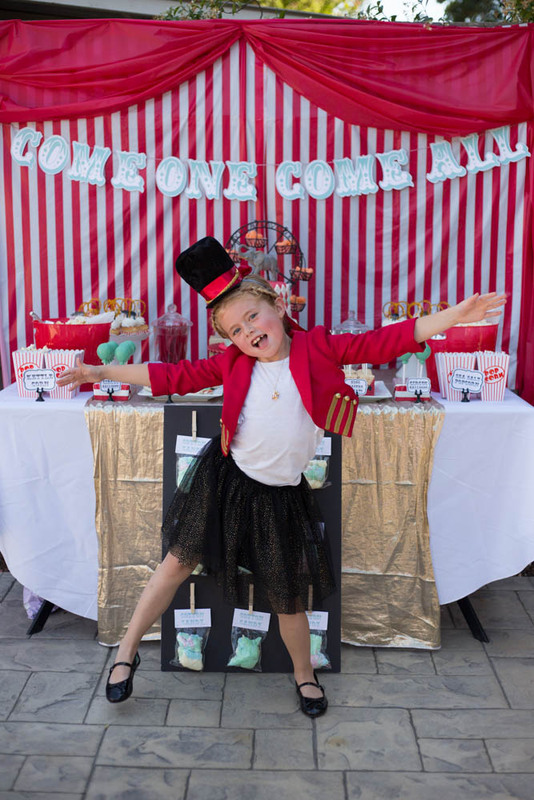 If you’re anything like my family, you’ve had The Greatest Showman soundtrack on repeat for the last while-my kids adore the songs! 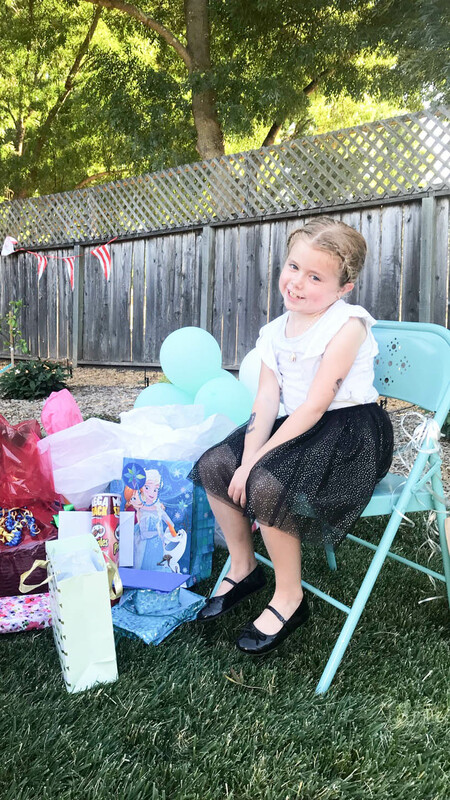 They are super catchy and singalongable (totes a word), and when Charlotte mentioned she wanted a party with that theme, I JUMPED. 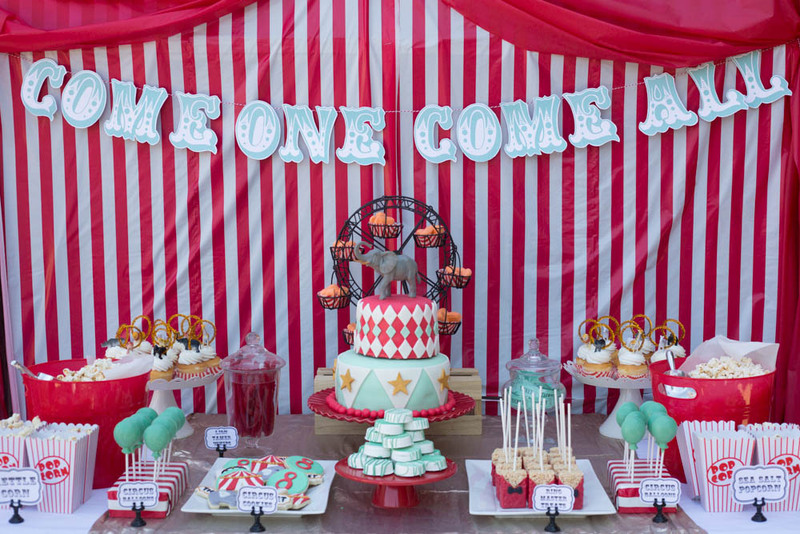 I’ve always wanted to do a circus party and this seemed like the perfect way to do one! 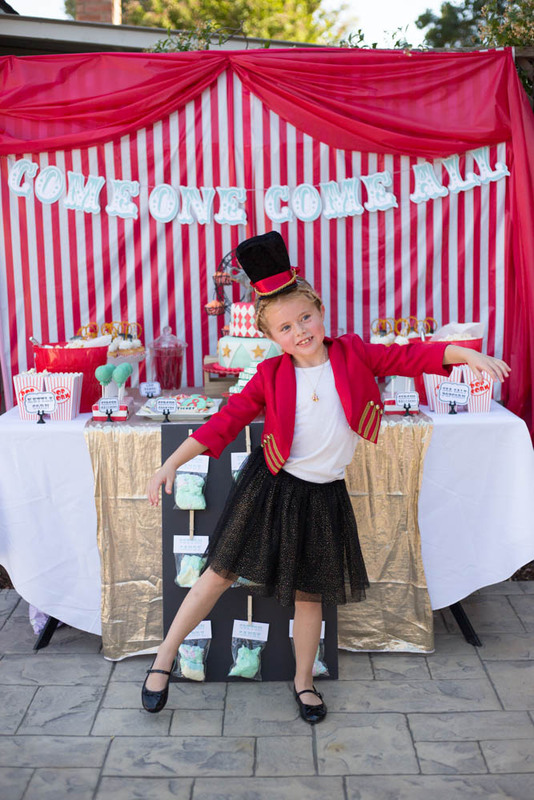 My little ringmaster! 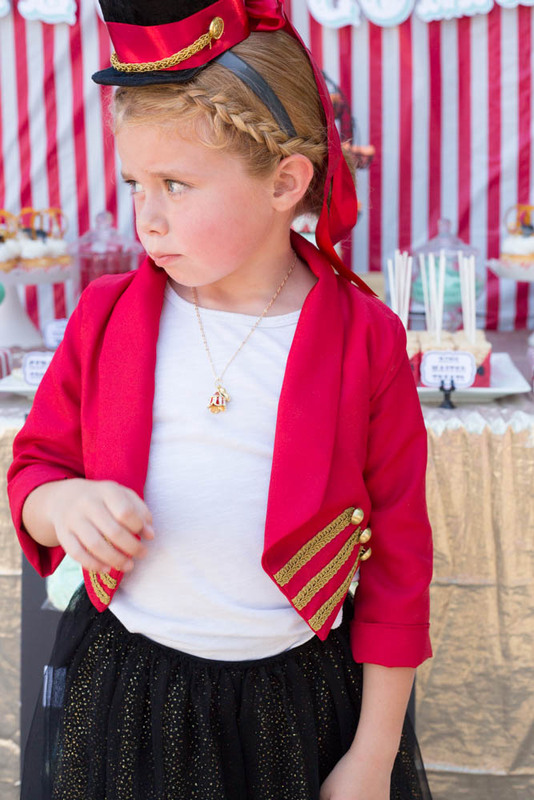 I absolutely adore how her outfit turned out-the skirt is Cat & Jack, and the jacket I sewed up using this pattern. I just added the gold trim before sewing it together and sewed on the gold buttons afterwards. LOVE! Her hat was one I borrowed from my mom-she manages the costumes for our ballet studio and has SO MANY AWESOME things. I think she wanted to go play with friends, that’s why she looks so forlorn. She loved her outfit though! 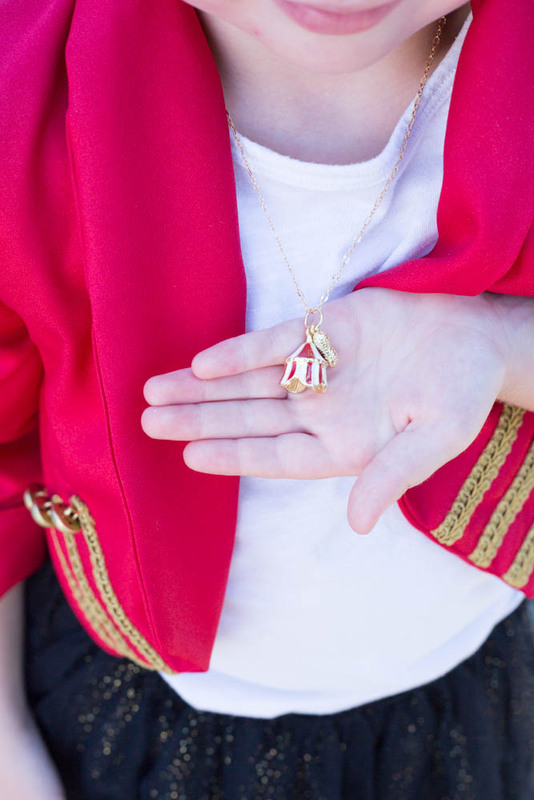 Her aunt Janae made this necklace for her and isn’t it just PERFECT!? the gold peanut! I just can’t even. 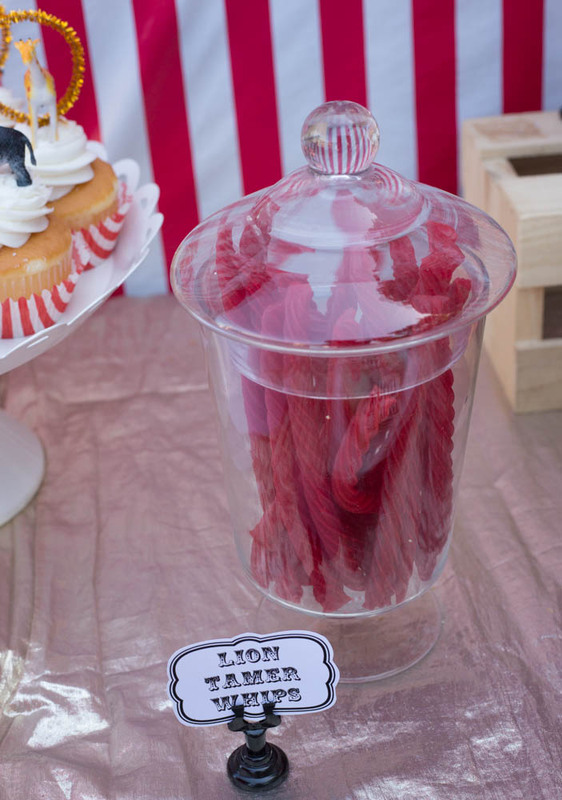 So for the backdrop, I used this striped tablecloth roll, and then added a swoopy thingy over the top with this red one. LOVE and I have so much left. 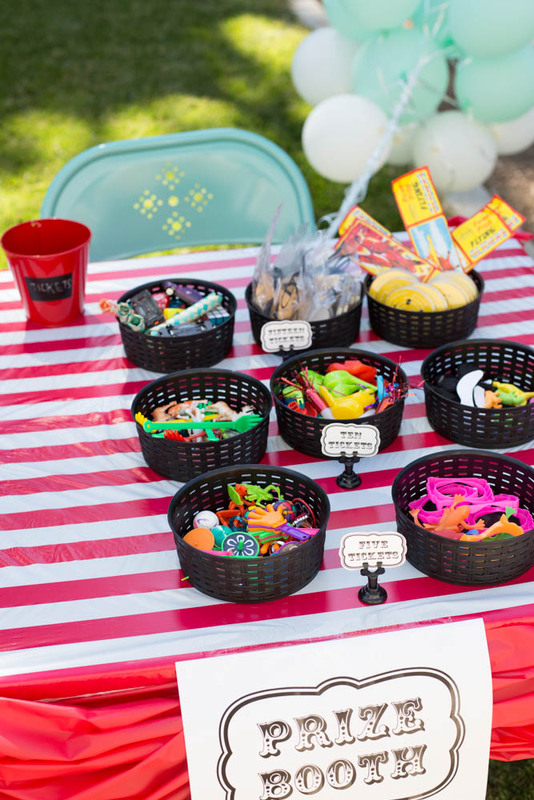 I need another red striped party theme I guess. 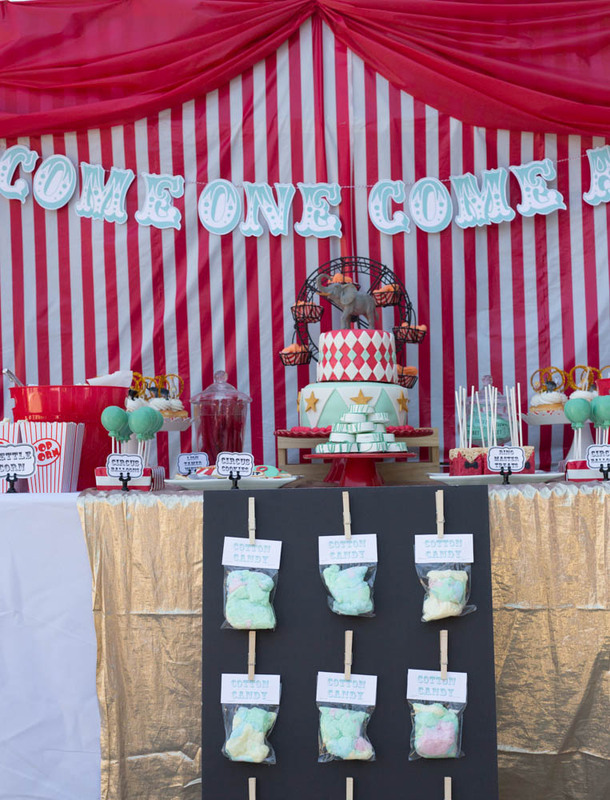 I made the Come One Come All banner with a free font and printed it out with a cute minty blue color! 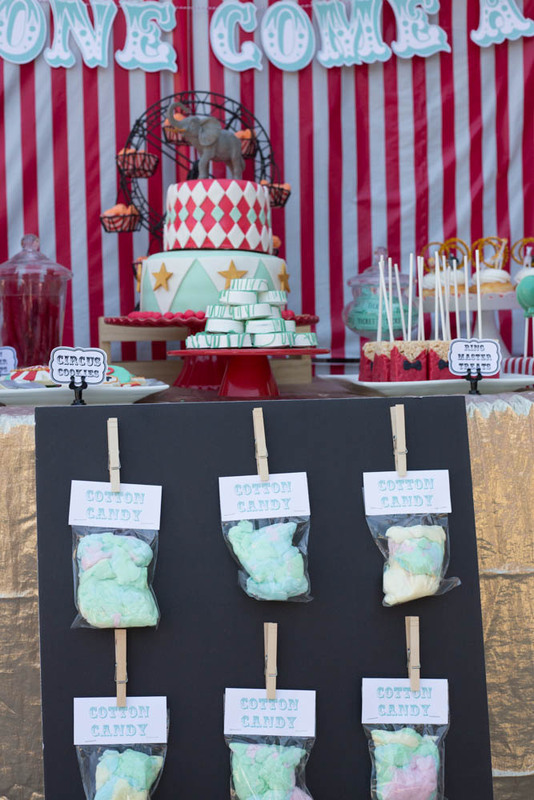 In front of the table I added a poster board with clothespins glued on, and added some bags of cotton candy with a cute label attached. 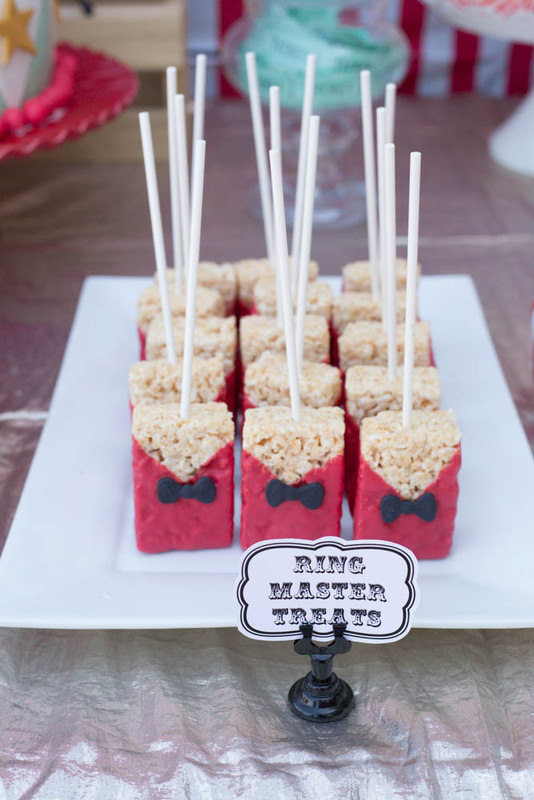 These ringmaster treats were suuuper simple but so cute! I dipped some rice krispie treats into red candy melts at an angle, and then added a black royal icing bow that I made ahead of time. Next; some chocolate balloon lollipops made with this mold. 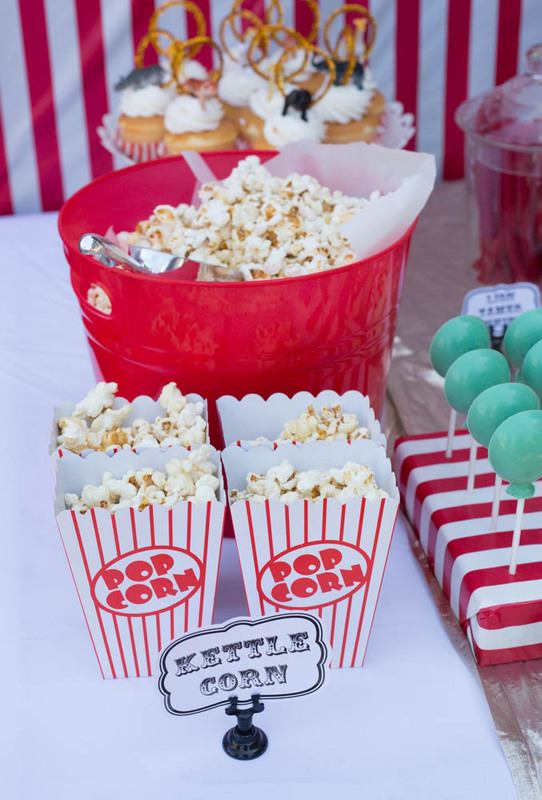 And also; popcorn because what self respecting circus party doesn’t have popcorn!? 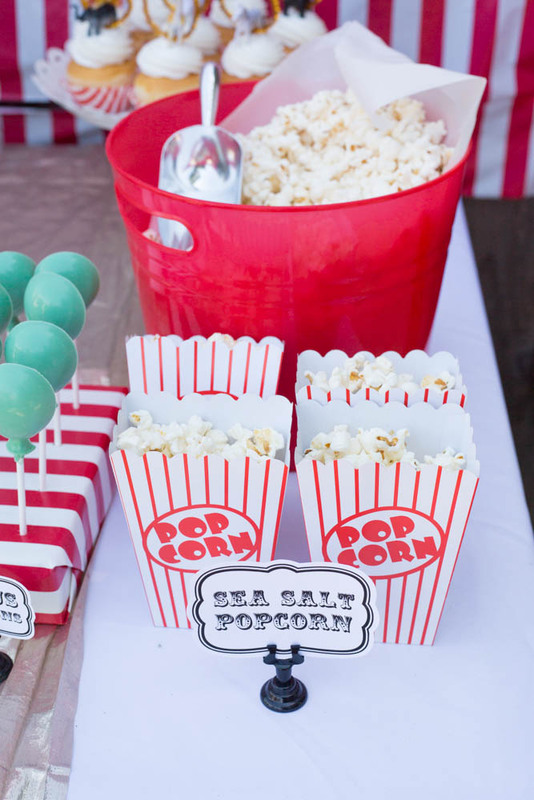 Sea Salt and Kettle corn, thank you very much! I grabbed this roll of tickets because it’s the perfect shade of green I was going for, then added some to my glass jar, and you’ll see more of it later too! 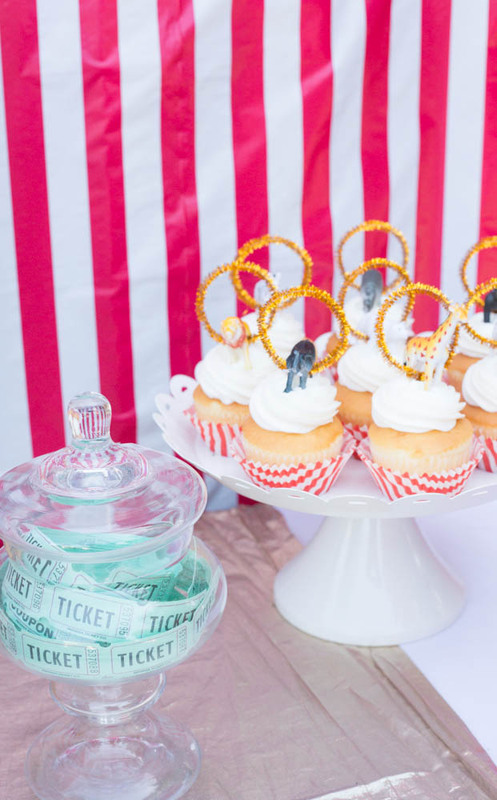 The cupcakes have some red striped liners, and then some adorable gold pipe cleaner “fire rings”, along with a tiny little circus animal jumping through it! 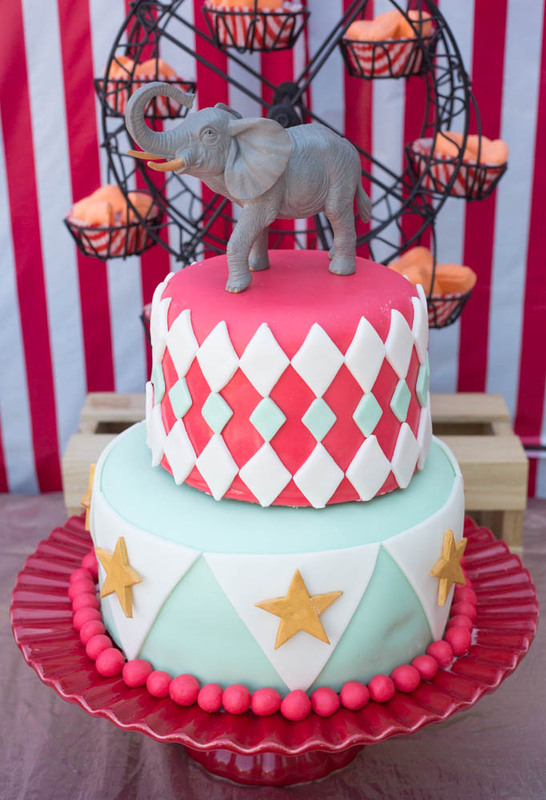 I had so much fun planning and making the cake! 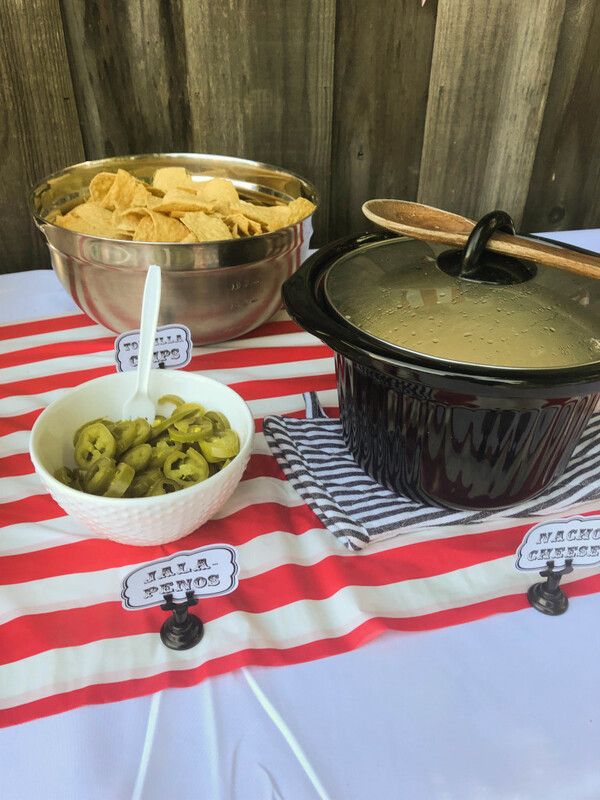 It was very hot the day of the party so we had some issues but overall I was very happy with it! The bottom tier was chocolate cake with peanut butter buttercream and the top tier was vanilla cake with fresh strawberry buttercream. yum! 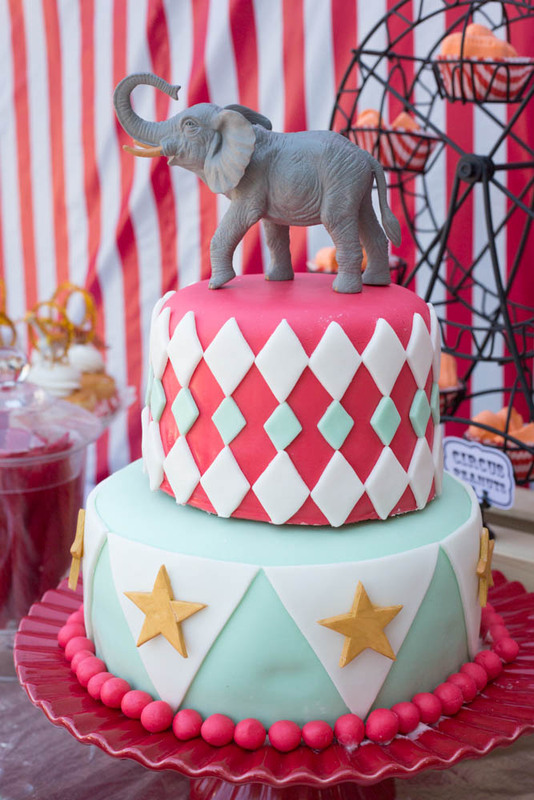 I made my own marshmallow fondant and went to town with the bright reds, mints, whites, and golds! 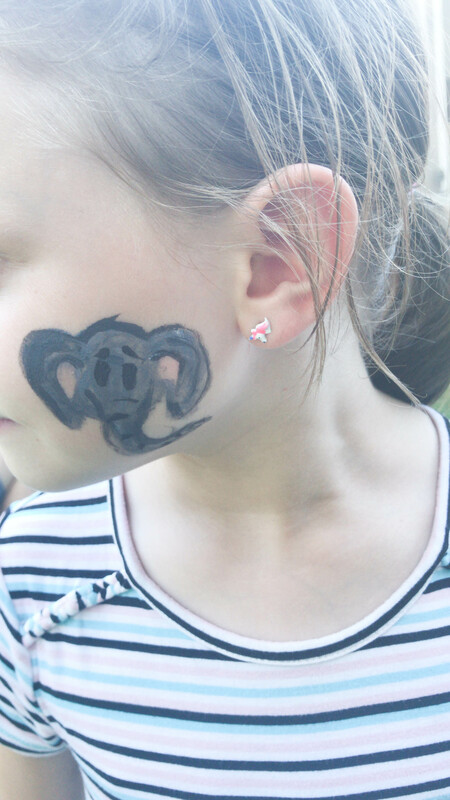 Then I added an elephant on top for good measure! 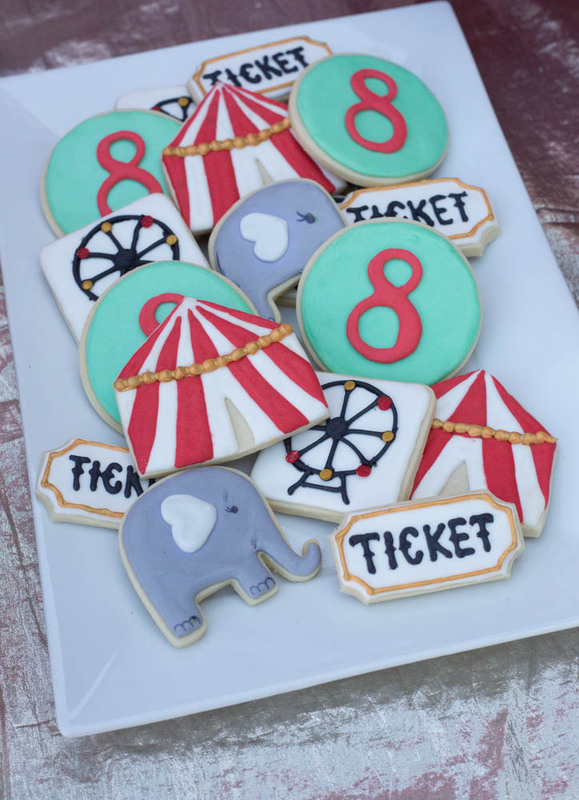 The cookies turned out so fun! 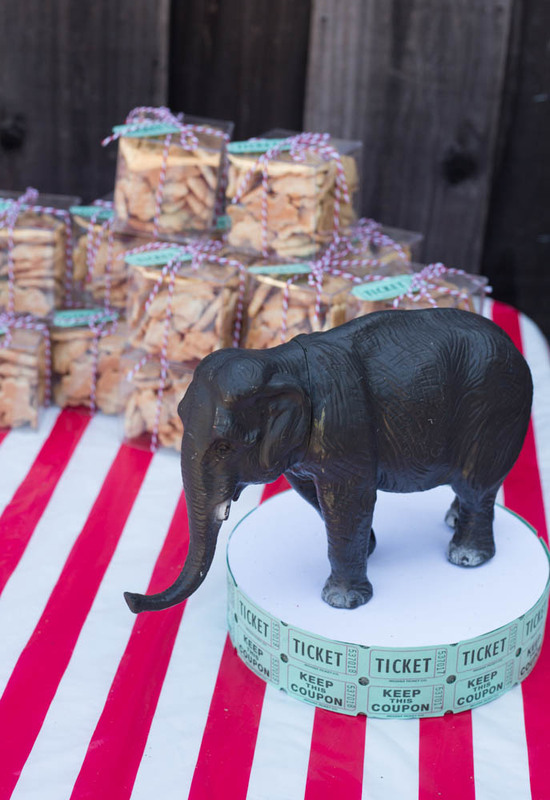 I hand cut out the tents and tickets, and the elephant was cut out with this cookie cutter. My sister Janae was visiting and loves to make cookies too, so I put her to work helping me bust these out! I used this gold stuff for the first time and LOVEd it. 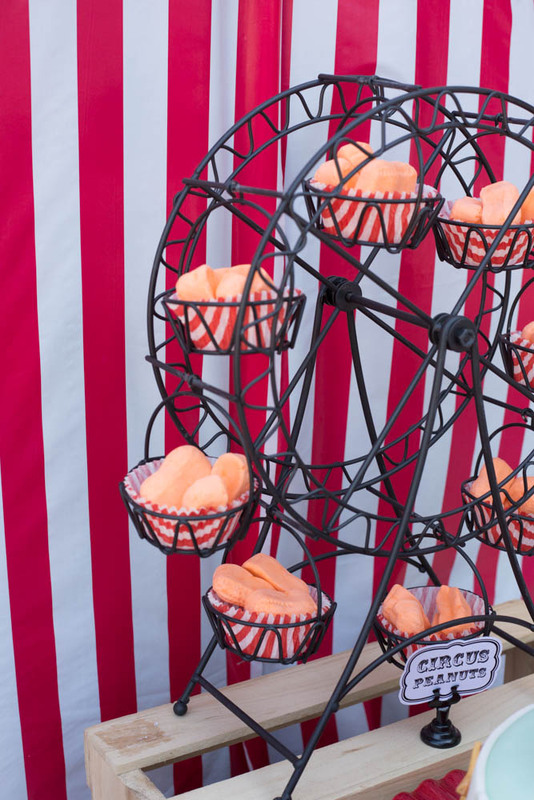 …circus peanuts in an AMAZING ferris wheel my friend Cassy got me! 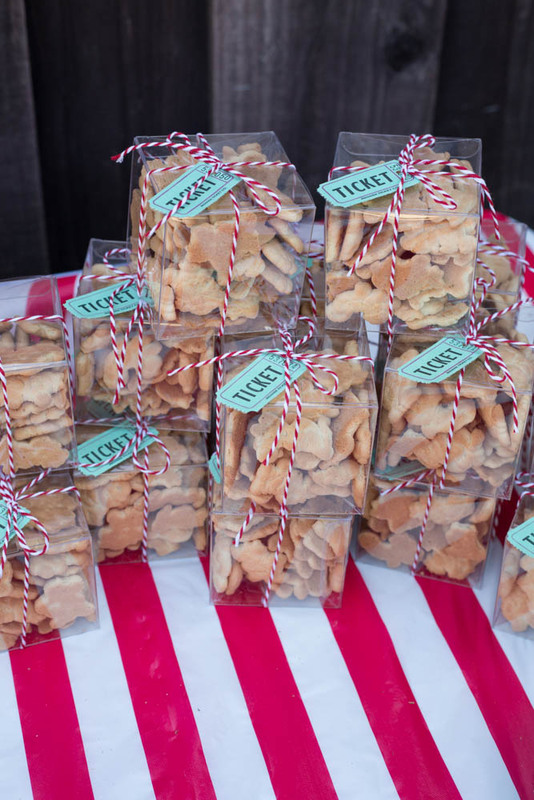 for the favors, I used these clear boxes and loaded them up with animal crackers, then packaged them up with some red bakers twine and a ticket! 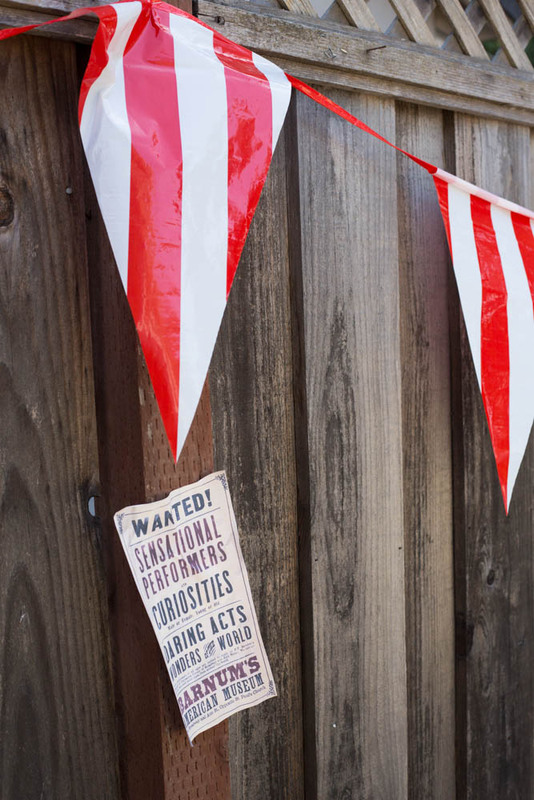 I printed some posters from the movie out and tacked them up on the way in, also added a (longer than I thought) red and white striped garland that added a super fun and cheerful touch to the yard! 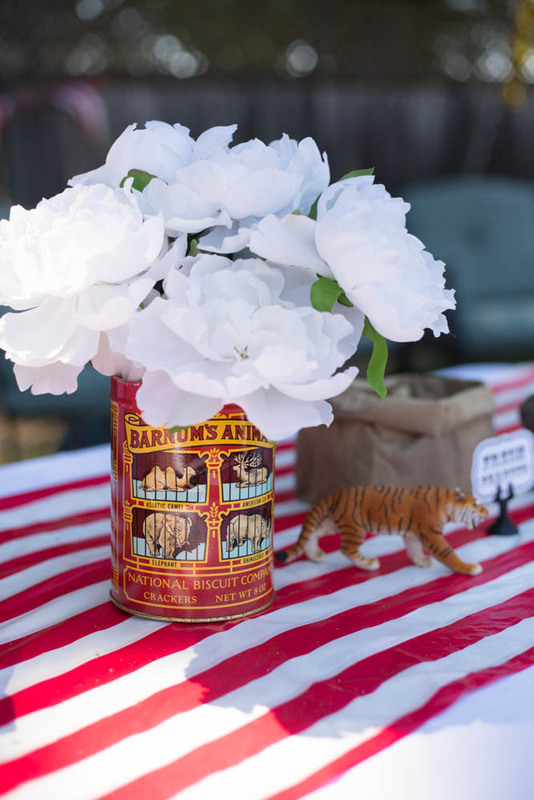 For the centerpieces, I bought several of these vintage animal cracker tins off of Ebay, and filled them with some faux florals from Michaels. 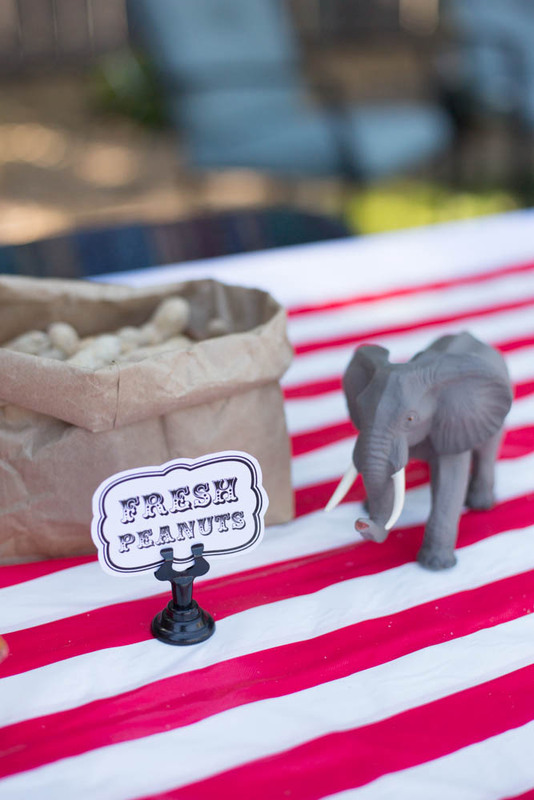 I also added some brown paper bags of fresh peanuts, and some more circus animals to the tables! 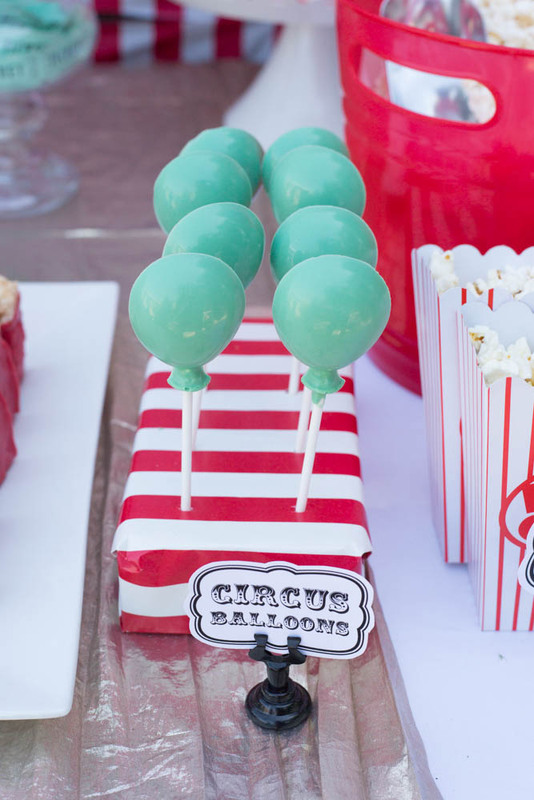 and of course, where there is a circus party, there will be circus games! 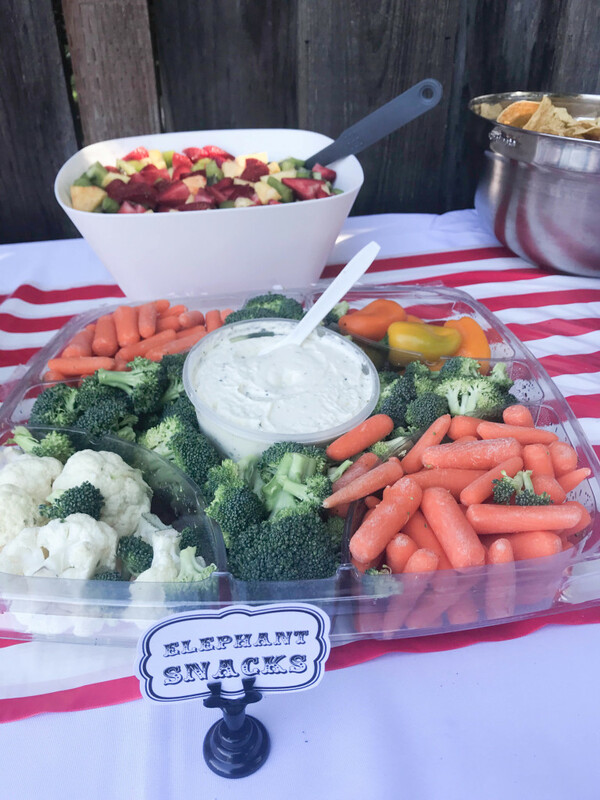 I had my friends and family help monitor the games, and the kids had a blast lining up and playing games for a good chunk of the party time! 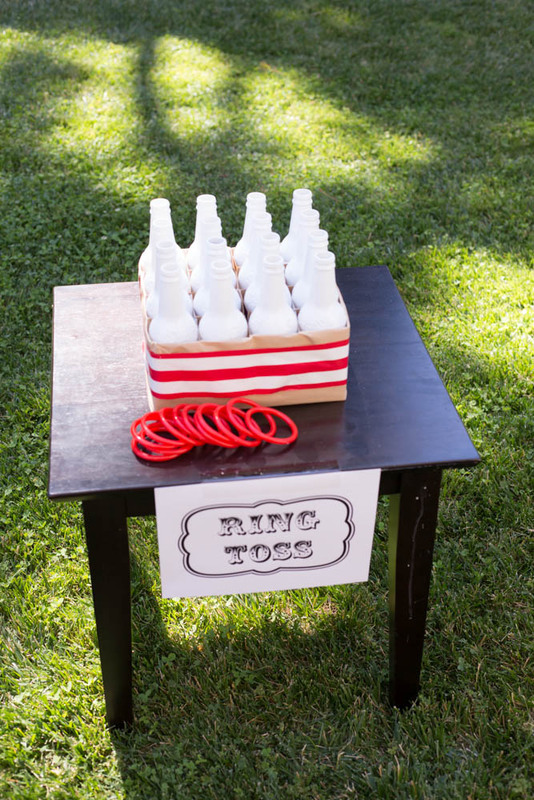 Ring toss! At our family & friends memorial day BBQ I gathered all the soda bottles my mom had purchased and after removing the labels & cleaning them, I painted them all white. I taped and covered the packaging together to create the game, and bought these little rings to complete it! I definitely kept this one after to reuse another time! 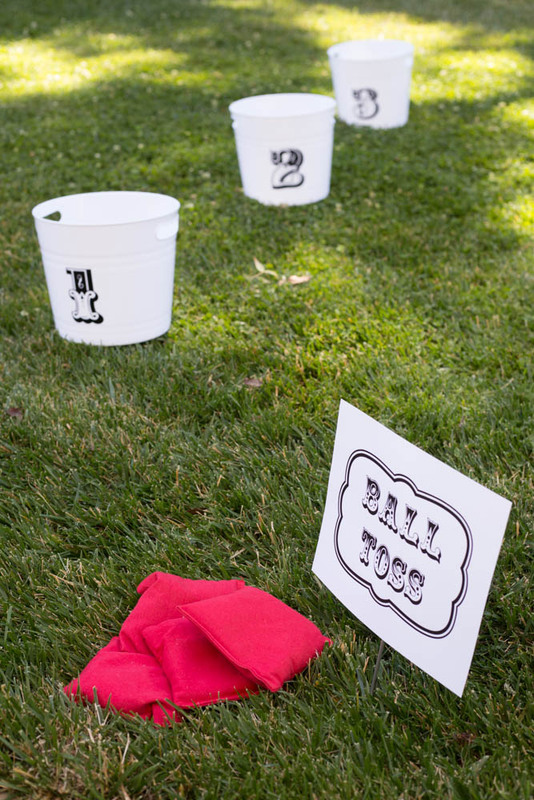 Grabbed some buckets on sale from michaels and cut the numbers out of vinyl with my Silhouette for the second ball tossing game. 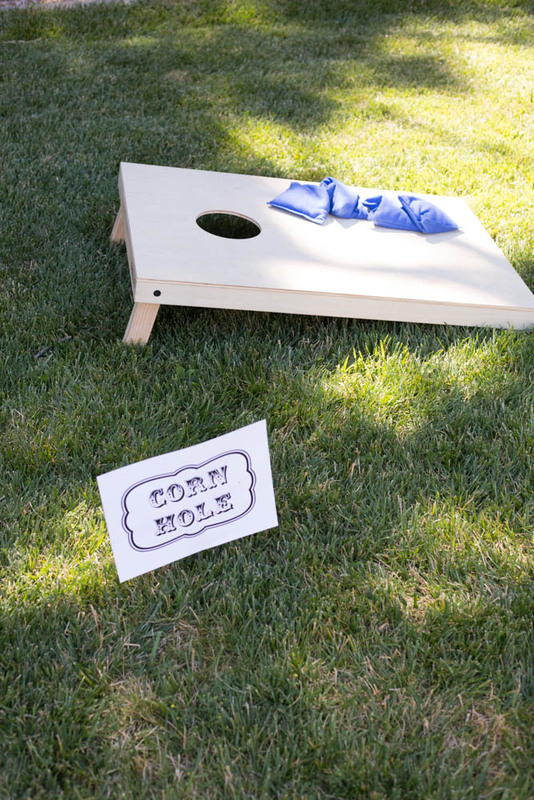 I’d been wanting a corn hole set for the backyard, so I bought this simple set and love it! So fun! We bought the tailgaters size. 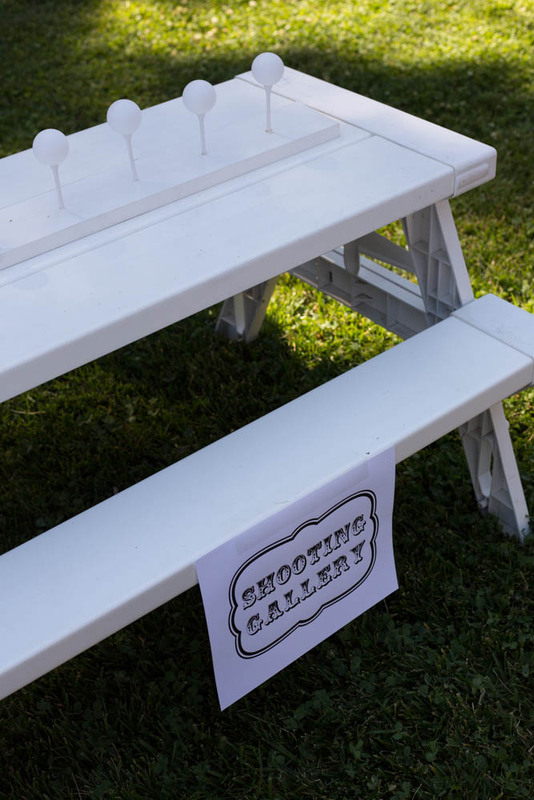 I’m missing the water guns in this shot, but basically they tried to shoot the balls off of the golf tees with water guns! I drilled holes in a spare bit of trim and then glued in the tees. Easy! 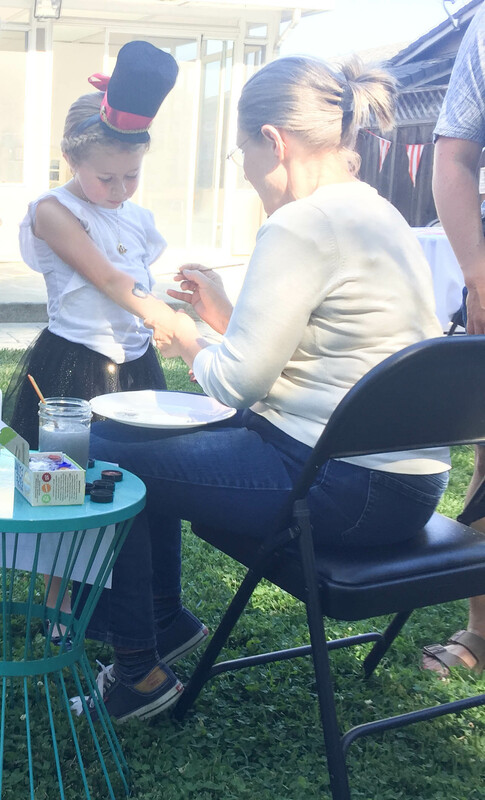 My mom also did face painting and I wish I had more pictures but she does AMAZING face painting!! 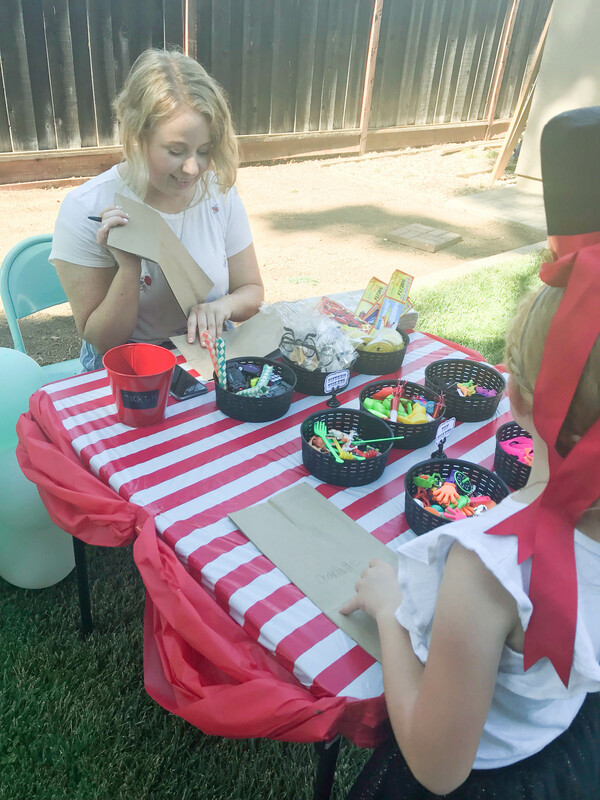 My sister manned the prize booth, and I had so much fun stocking it! 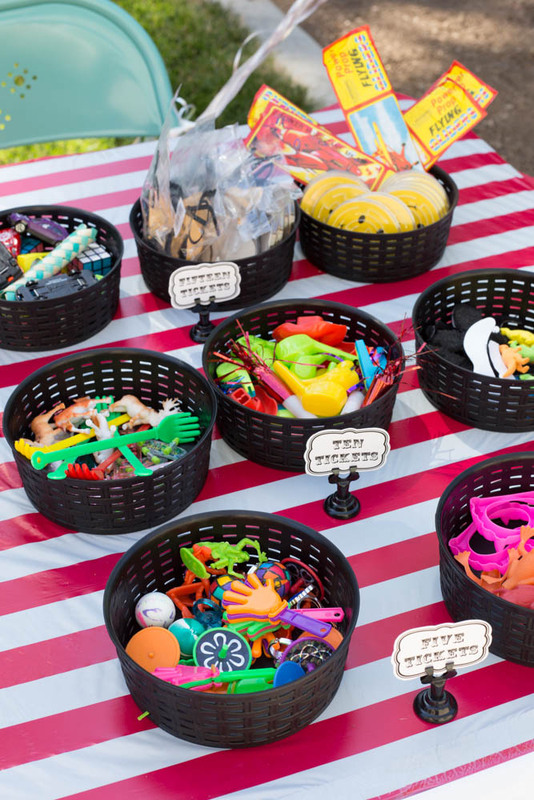 I grabbed these black round baskets from the Dollar store and filled them with prizes! 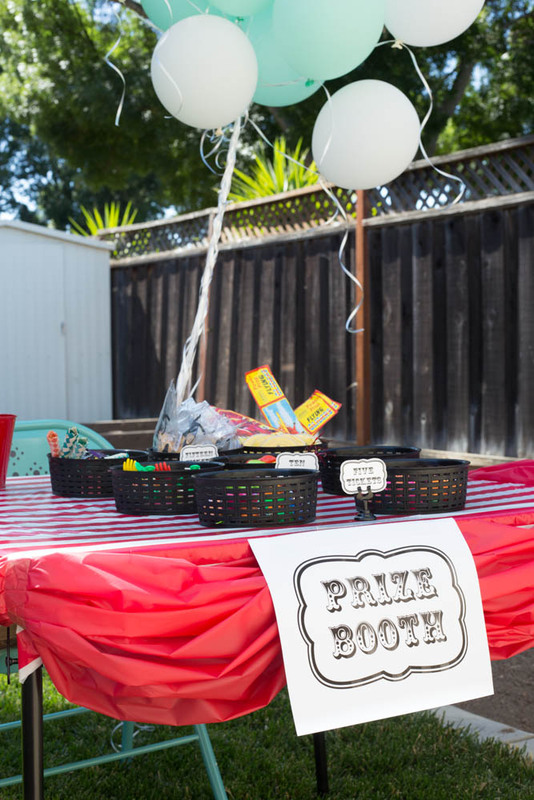 Some I got from the Target dollar section, others from the dollar store, but the bulk came from this large prize bag. 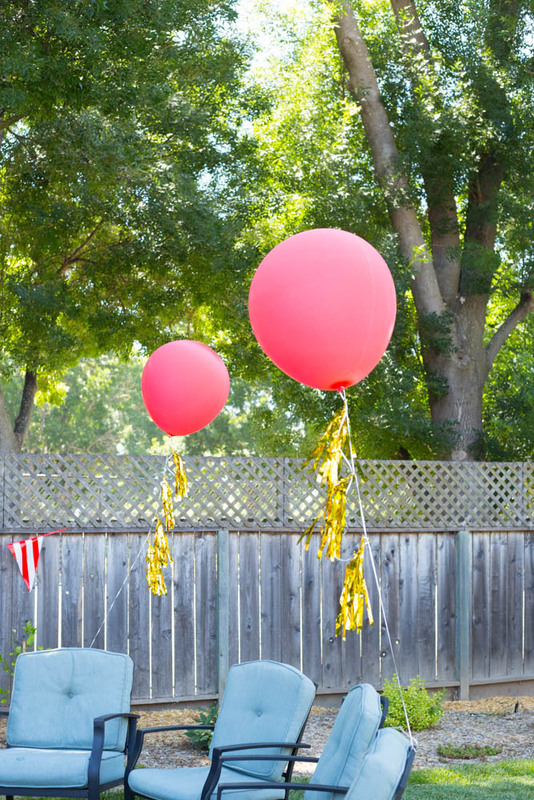 I didn’t have many balloons around, but these big ones always pack a visual punch! Tied on some gold tassels I had on hand. 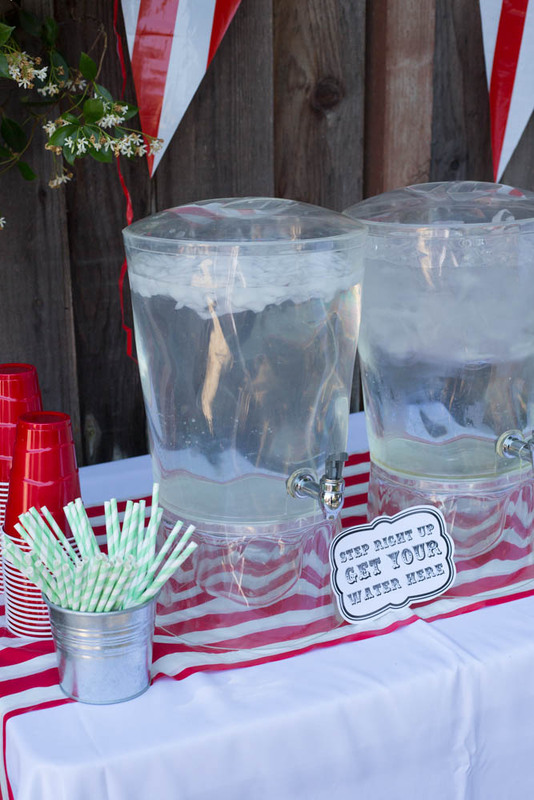 I had LOTS of ice water on hand since it was a hot one! 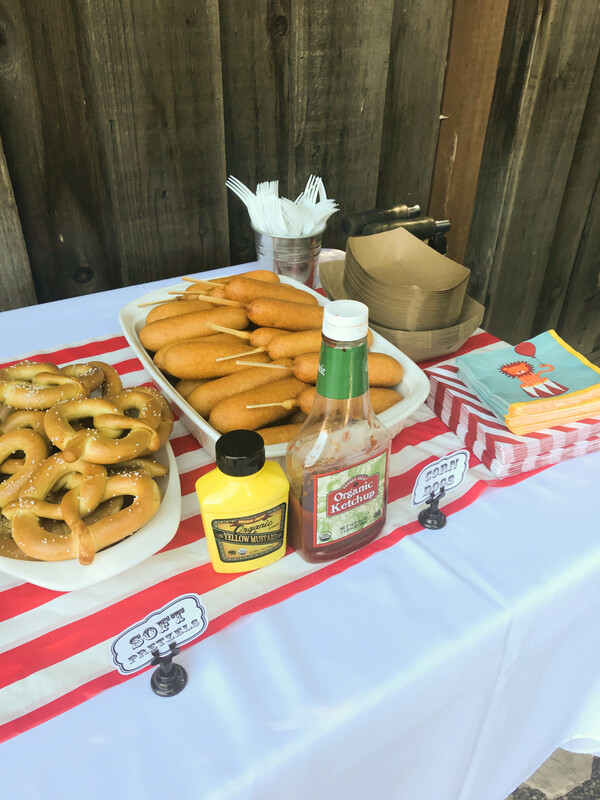 …and last but not least, corn dogs and soft pretzels. 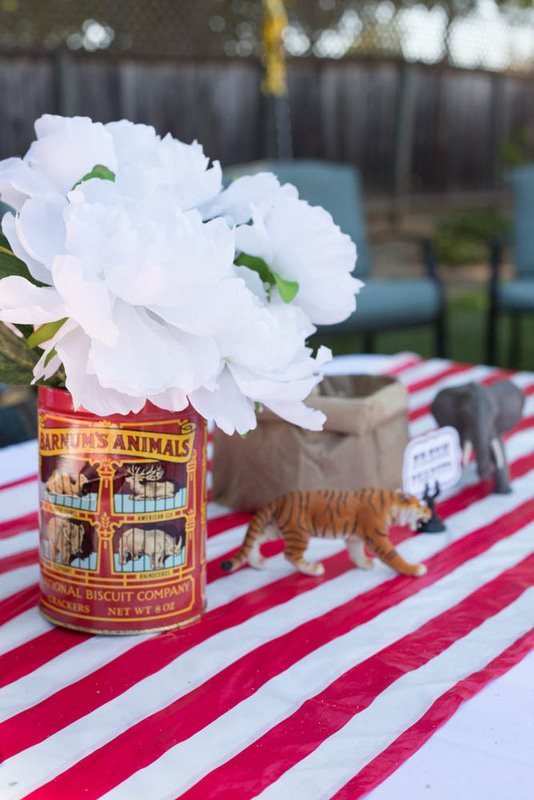 I have saved those lion napkins that I got on clearance from Target for pennies…for about 8 years or so! I probably bought them around when I had Charlotte, lol! At least I got to use them! 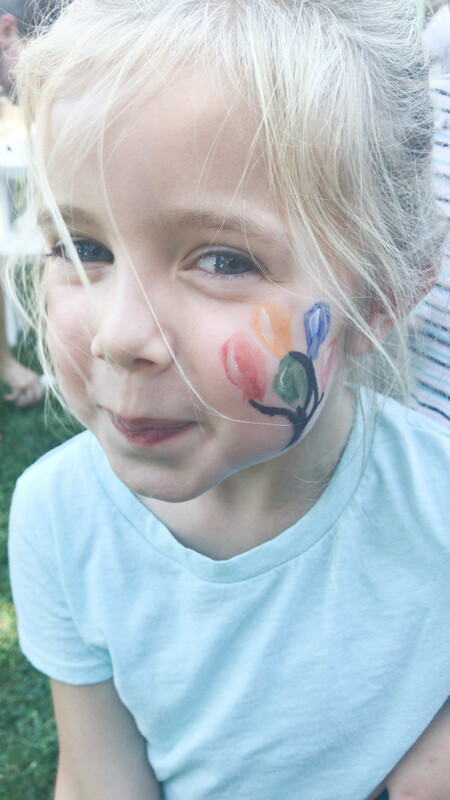 We all had a blast celebrating our birthday girl! 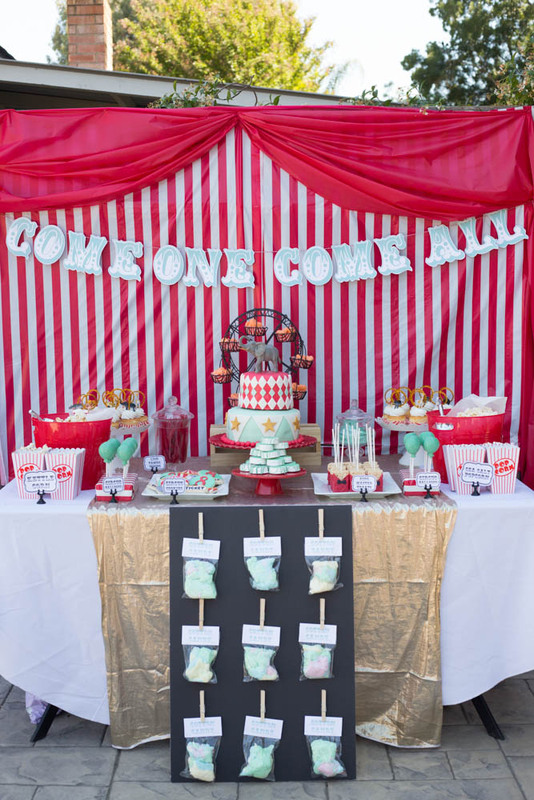 TThe first time I saw your blog was the post on Charlotte’s Cute as a Button party. Has that been 7 years? Time flies! Great job again. 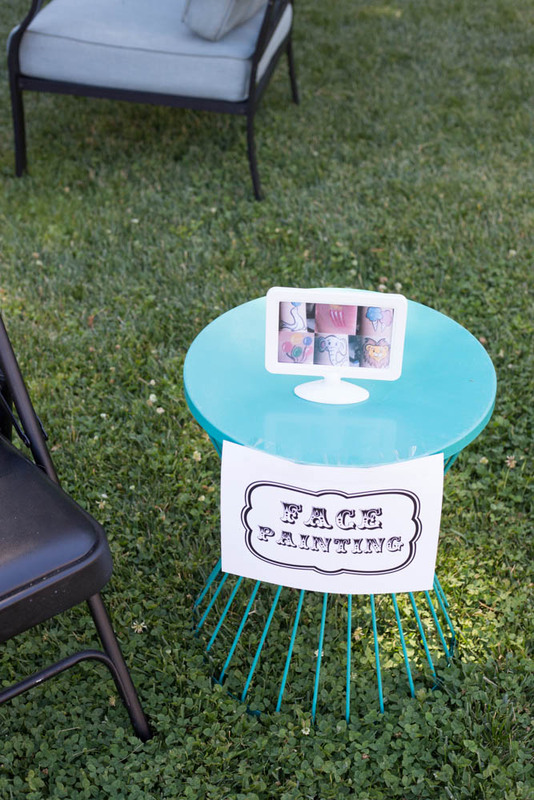 Love seeing your creative ideas. wow that was an oldie!! I love to look back at my party posts to see how little they were back then! Wow! That was exhausting enough reading… can’t imagine how exhausted you were after all that prep! So worth it though. 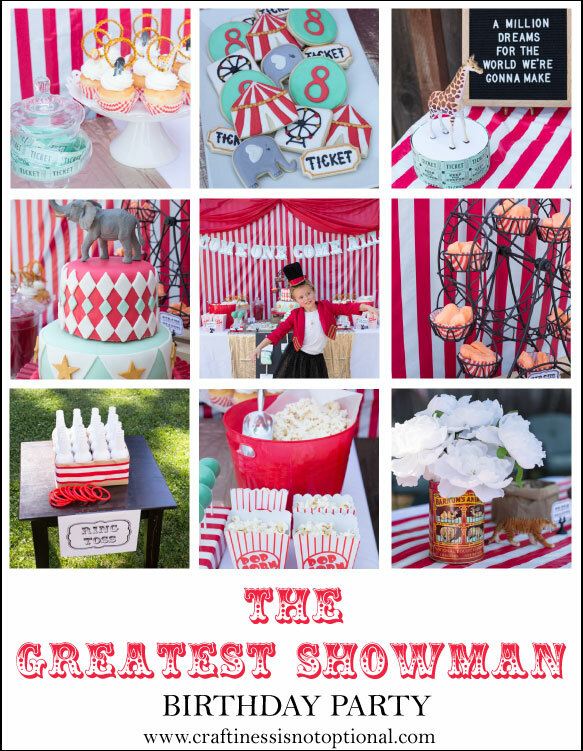 Looks incredible Aut what a very lucky party girl….Happy birthday! You always have good ideas and you make them with with a lot of talent ! Love love love! We are working on this theme so if you have anything left to sell off, please contact me! Do you still have things left?! Thanks! I do have some things left over! If you email me over at [email protected] I can send you a list and pic! This is awesome!! You did an amazing job!! Do you still she the tins from eBay?? I sold them recently, sorry! Hi. 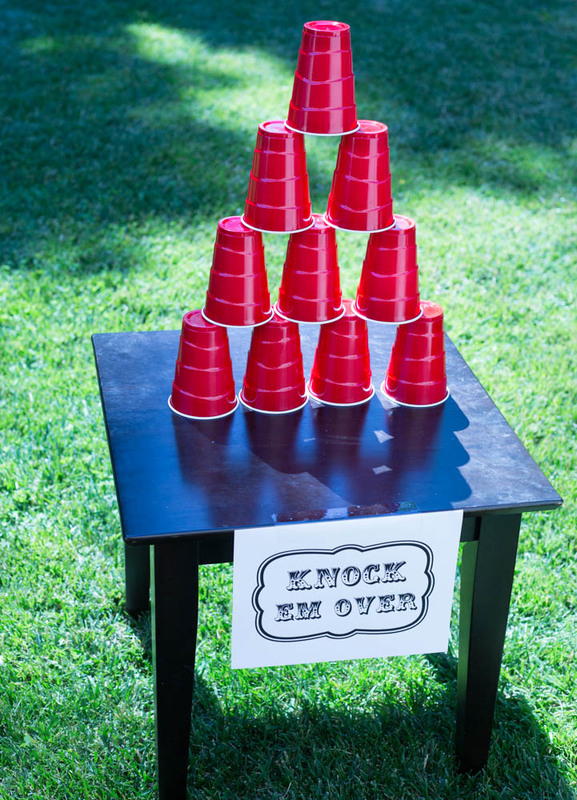 I absolutely love this, very creative! 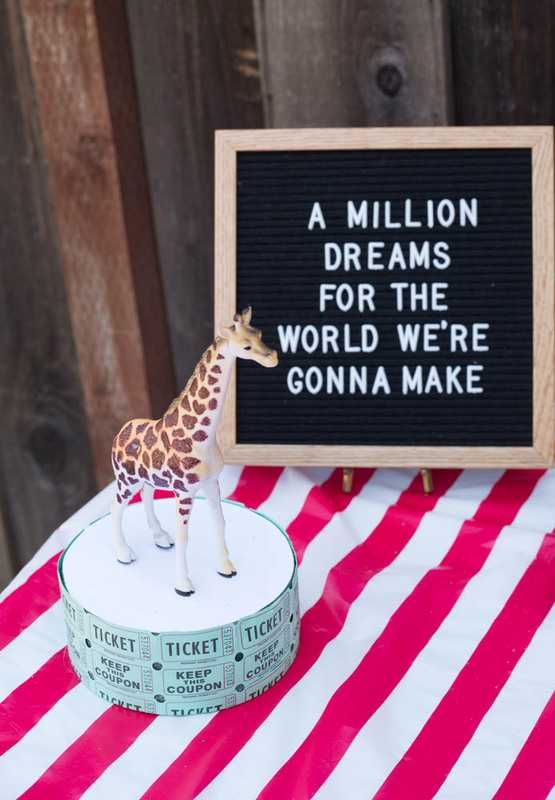 Could I please ask where you sourced this circus font for all your labels?